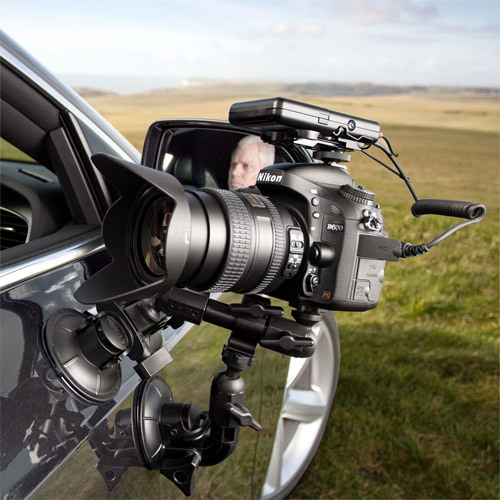 Designed to cut down on vibration, the Fat Gecko Triple Mount is ideal for those shooting with a heavier DSLR and lens combination or just aiming to get the most stability for video shoots. 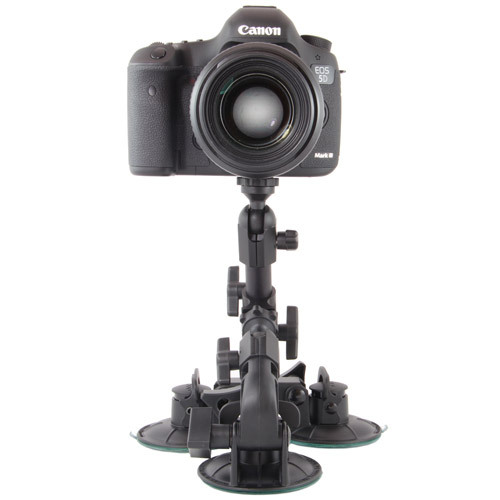 Utilizing three industrial locking suction cups, the Fat Gecko Triple creates a strong, trustworthy attachment to any smooth non-porous surface or object and is our most stable mount to date. 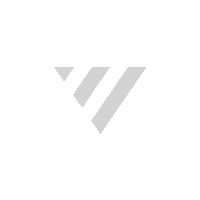 The Triple is also made out of an anodized zinc, making it able to resist corrosion, wear & breakage for years of use. The Triple is ruggedly constructed to endure even the most strenuous shooting environments, where wind, g-force, water, vibration & speeds over 150 mph come into play. 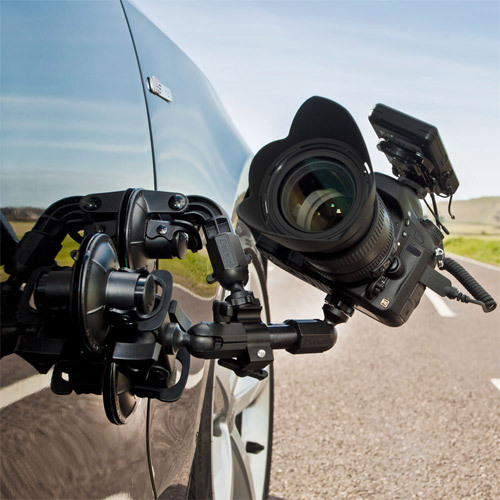 The stainless steel ¼-20 post enables universal use with cameras and camcorders weighing up to 12 lbs. (5.44 kg. ), and features a locking ring to prevent spin in rough conditions. Six adjustment points are built into the Triple: three pivoting joints at the suction cups to accommodate flat or curved mounting surfaces and three ball joints that enable 360° tilt, turn and rotation for a totally customized set up. The two inch extension arm provides additional reach to shoot around and over obstacles when needed. Rugged construction & an anodized metal design keeps heavier equipment steady, while the patented locking suction cups hold securely and create an easy, quick, damage-free attachment. Six adjustable joints enable 360° tilt, turn and rotation so you can achieve virtually any shooting angle desired, hands free. The rotating ball head and extension arm help you to customize the perfect shot, even around fenders or in tough spaces. 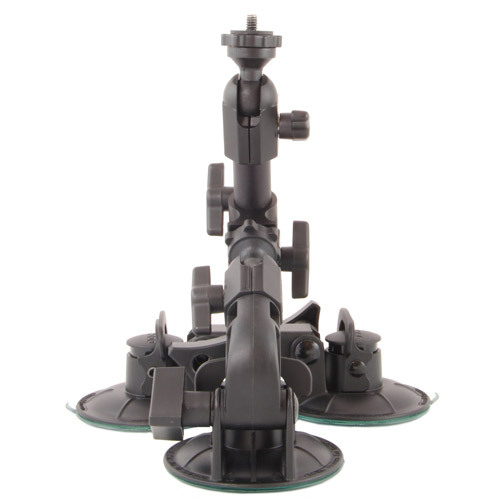 As each suction cup is adjustable, the Fat Gecko Triple Mount can accommodate rounded surfaces and angles, as well as flat surfaces, with ease. The Fat Gecko’s standard 1/4-20″ tripod mount can be used with virtually any photography equipment weighing up to 12 lbs. (5.44 kg. 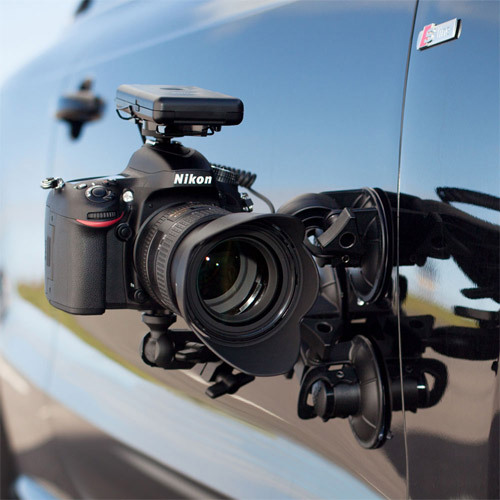 ), including DSLRs, mirrorless cameras, camcorders, compact cameras, action cameras, and more. Attach the included hot shoe adapter using the built-in 1/4-20″ thread and expand your mounting possibilities to include flash units and more. Also included is a rubber washer, designed to dampen vibration even further from wind or moving shooting surfaces.